Which One of These Individuals Will Most Likely Text You for Help? If your answer is "all of the above," you're right! Demographics of the texter have shifted drastically. Just in the last two years, texting (which was considered by many to be a communication tool predominantly used by teenagers) is now being used across all ages, demographics... even seniors. And today, Americans under 55 text more than they make voice calls and email! That's big news for I&R providers and helplines! Begging the question, is your helpline text-enabled? PreventionPays Text offers a very simple, cost-effective way to go live today by removing all the hassles! PreventionPays short codes offer guaranteed nationwide coverage on ALL mobile carriers! Tier 1 short codes protect end user privacy with fully automated opt in/opt out (so you don't have to). And if you're a 2-1-1 or I&R and AIRS member, we have very special rates for you! So, this year, there's no excuses. Get texting today and be ready for the next-generation help-seeker now! At this very moment someone is trying to text your agency! We see hundreds of texts every day from regions not yet covered by our services! Turn your region on! Start capturing your clients before they go somewhere else for help! Not ready for live help? 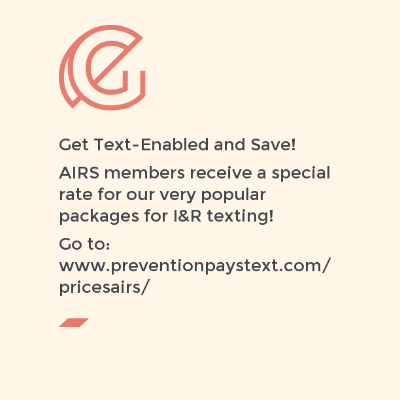 Here are just a few ways helplines and I&R providers are using PreventionPays Text for communications besides live, conversational text support! Use our text referral tool! Provide secure information by text! Need it to integrate with a CRM or referral software? We have a very user-friendly API for third party agencies to hook up to today! Send group messages (but tailor them according your clients' specific needs or region/city/zip etc.) PreventionPays Triage not only manages the opt in, but will query end users for crucial information that can trigger an automatic referral or the closest 5 referrals or whatever else you'd like to send them based on their responses. See blog post: "Three Text Alert Programs, Zero Optouts"
Offer fully automated text referrals using our Express Text Utility! Yes, you heard that correctly. We're taking high call volume issues like food assistance or energy assistance and automating the Q&A process so that redundant referrals can be deployed without any staff involvement! Get funding using our system as a catalyst! We've helped our clients win grants (now totaling tens of millions) because they include information about our platform and our capacity in their proposals! Get Text-Enabled Today and Save!